Synchrony helps organizations use public policy and communications tools to protect their brands, stimulate innovation, expand markets and reduce costs to produce a measurable impact and grow bottom lines. 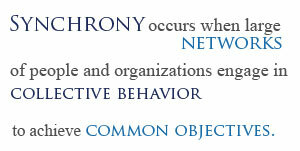 For corporations, this often means developing policy strategies and leveraging relationships. In many cases, it also means building new relationships with other organizations to create constituent networks, secure alliances and win new customers. For organizations, our work is focused on advancing agendas, extending reach and increasing impact in highly targeted and measurable ways, in Washington and around the world. For governments, we focus on stimulating economic development. That often means opening markets, developing infrastructure and attracting investment. For all our clients, we seek innovative, disruptive opportunities to stimulate growth and address problems that could inhibit it. Our engagements range from short-term projects that help senior managers address specific issues, to long-term, transformational efforts that may require years to achieve. And in every case, we impart new skills and capabilities, which our clients can take forward and apply to new challenges and opportunities, as they arise. We have a unique core competency in Washington and bring complementary skills to your team. We are business people working with business people. Our goals are business goals -- brand strength, innovation, growth, lower costs and bottom-line earnings. Our work is simply a means to your ends.